Delhi rooftop solar cheaper than electricity bill! Delhi is a huge consumer of electricity – it uses more power than all other metros put together. The peak power demand in Delhi in 2014 was ~6000 MW, almost all of it coming from coal and gas powered plants located in Delhi. The impact of these on air quality and health is huge, with Delhi routinely making the lists of the most polluted cities in the world. By August 2015, Delhi had 7 MW of installed rooftop solar photovoltaic capacity. However, the rooftop solar energy potential of Delhi is many times this, at ~2500 MW. Of this, 25% is in the commercial / industrial sector and 49% is in the domestic sector. People-driven rooftop solar thus has the potential to significantly improve the quality of life of Delhi citizens. Rooftop solar is also a great way to invest your money – as this article will show, if you have shadow free roof space, you can install a solar power plant, save money on your electricity bill and thereby earn handsome returns on your investment. Tata Power Delhi Distribution Limited (TPDDL) formerly North Delhi Power Limited (NDPL) is promoted by Tata Power Company. 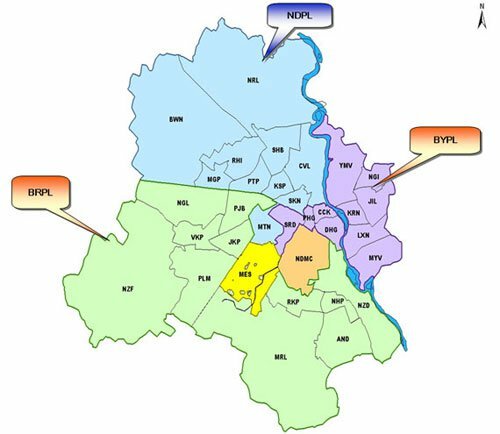 It serves North Delhi, including the regions of Badli, Bawana, Burari, Civil Lines, Keshav Puram, Mangolpuri, Model Town, Moti Nagar, Narela, Pitampura, Rohini, Shakti Nagar and Shalimar Bagh. BSES Rajdhani Power Limited (BRPL) promoted by Reliance Energy, serves South and West Delhi including Alaknanda, Khanpur, Vasant Kunj, Saket, Nehru Place, Nizamuddin, Sarita Vihar, Hauz Khas, R K Puram, Janakpuri, Najafgargh, Nangloi, Mundka, Punjabi Bagh, Tagore Garden, Vikas Puri, Palam and Dwarka. Rooftop solar size limited to 100% of sanctioned / contract load. Consumers can install solar greater than sanctioned load on paying a one-time Service Line Development (SLD) charge. No state level capital subsidy. Additional Generation Based Incentive (GBI) of ₹2.00 per unit of gross solar energy generated for 3 years from date of the policy taking effect. Since the APPC is quite low, oversizing the rooftop solar plant does not give much financial benefit. We recommend that Delhi electricity consumers size their system so as to generate only as much as they consume over the year. As the year begins in April which is also the start of summer, consumers who use air conditioners have much higher bills in summer than in winter. If the solar plant is sized on the average usage, such prosumers will end up paying electricity bills at higher tariffs in the summer and compensated at the lower APPC at the end of the year. Such prosumers could find it worthwhile oversizing their solar system slightly, based on how much they desire to lower their summer bills by. Use our convenient solar sizing calculator and quote generator to find the appropriate plant size and costs for your requirement. ¹ Rates taken from Delhi electricity tariffs effective 1st Oct 2015. Includes surcharge @8%, tax @5%. As you can see, the EMI in all cases is less than what your electricity bill used to be before installing solar. The electricity bill after installing solar is zero, thus giving you a net monthly benefit. The surprising result is that if you install solar on your rooftop today, you start benefiting from the first month itself! These calculations are based purely on savings from the electricity bill, and do not include the incentive (GBI) of ₹2 per unit mentioned in the policy. Electricity tariffs in Delhi have risen @ 6.9% per year on average since 2007. Going in for net metering hedges or shields you from future rate increases over the 25 years of the PPA. Thus you can add this rate to the ROI above. Business owners can expense out the interest part of the loan EMI. While the loan in the examples above is fully paid off in 7 years, the useful life of photovoltaic systems is 25 years. As the PPA is also valid for 25 years, you effectively get free electricity from year 8 to 25! The net effect of the above allowances would decrease effective returns by ~2.5% per year. The returns remain extremely attractive. This post first appeared over here. This post is a guest contribution by Oorjan Cleantech, a company that enables solar rooftop financing. It is an initiative by Alums of IIT Bombay having years of experience in Solar PhotoVoltaic Markets. They have an estimator and contact form on their website www.oorjan.com.